Smoothies are blended drinks made with fruit and any combination of vegetables, ice, dairy products or dairy-free milk, water, and powder. If the smoothies include fruits and/or vegetables, blending them retains the fiber from the produce, unlike juices. The fiber in smoothies can help to keep blood sugar levels stable, keep you full for longer, re-balance your digestive system, and ultimately help you lose weight. Smoothie diet plans usually involve drinking at least one smoothie per day as a meal replacement, and many include drinking two or more per day. In 2004, Victoria Boutenko, author of Green Smoothie Revolution and Green for Life, developed the first green smoothie by blending dark leafy greens such as kale, spinach, and romaine lettuce with fruits like bananas, blueberries, and peaches. Some green smoothie recipes call for adding dairy-free milks such as almond or rice milk, but water can also be added before blending. Boutenko calls green smoothies the "most epic nutritious concoction the world has seen to date." 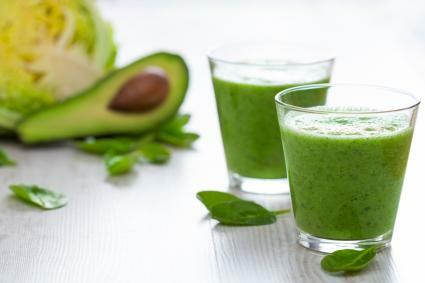 Green smoothies have many health benefits and are the focal point of some smoothie diet plans. The Nutribullet Superfood 6-Week Transformation Plan involves three stages that each last two weeks. Each stage includes one or two Nutriblast smoothies in addition to whole foods-based meal plans. A Nutriblast contains 50% dark leafy greens such as kale, spinach, collard greens or spring mix, 50% fruit such as berries or apples, and a ¼ cup of a 'Nutriblast', such as nuts, seeds, or superfoods. These smoothies are made with the Nutribullet, a high-powered nutrition extractor, championed by Raw Food and Nutrition Expert David Wolfe. The Nutribullet does not blend or juice your produce, rather it breaks down the cell walls of your fruits and vegetables into their most nutritious and easy-to-absorb state. This plan can be a great option for busy people who don't have a lot of time to cook their vegetables. You must invest in a Nutribullet in order to see the benefits from this approach. People who like crunchy foods may feel unsatisfied in the first phase of this program since two meals per day are liquid. Smoothie recipes do not include a dense source of protein, such as protein powder, which helps you feel full for longer. When drinking a smoothie alone for breakfast, this may lead to cause low energy, cravings, or lack of satiety. The 28-day elimination and detoxification diet outlined in The Whole Life Nutrition Cookbook begins with two days of fasting and drinking only green smoothies and water. Tom Malterre, clinical nutritionist at Whole Life Nutrition and Alissa Segersten, author and cooking instructor, recommend continuing to drink a green smoothie for breakfast each day for the rest of the elimination diet, in addition to eating healthy, whole-foods based meals and snacks. The diet is broken down into three phases. At the end, people are encouraged to add back in potentially allergenic foods like gluten, dairy, or eggs, one at a time, and notice any symptoms. In this way, people can determine what is causing their chronic health problems. Some people may feel deprived on this type of diet if they are accustomed to eating a lot of gluten, dairy, eggs, and other common allergens. The first two days of this diet include only green smoothies which may leave some with low energy, especially since smoothie recipes lack protein powder. One must adhere to the diet 100 percent in order to achieve accurate results and identify problem foods. Eating out can be challenging on this type of diet, so the authors recommend preparing all your own food during the diet. Not all smoothie diet plans are centered around green smoothies. You can make smoothies with all kinds of healthful ingredients of varying colors, and they often serve as meal replacements in weight loss programs. 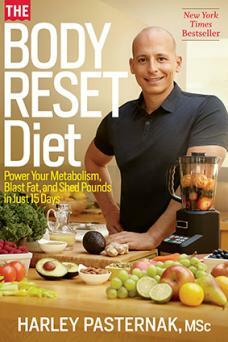 Written by celebrity trainer and nutritionist Harley Pasternak, The Body Reset Diet book outlines a 15-day program with three phases. The first phase is a five day jump start that includes three smoothies a day; one for breakfast, one for lunch, and one for dinner, as well as some healthy snacks. Suggested snacks include air-popped popcorn or raw vegetables and hummus. Phase two includes two smoothies and one solid meal per day and phase three includes one smoothie and two solid meals per day. Some of Pasternak's smoothie recipes include fruit, greens, water, Greek yogurt, and/or soy protein powder. The smoothies are easy-to-prepare without having to spend a lot of time in the kitchen. If you are accustomed to eating three solid meals per day, it may seem challenging to switch to all smoothies for five days. Some may feel hungry or shaky if the smoothies do not include enough protein. Watch out for smoothies with too much fruit or without vegetables. Too many sweet fruits like mangos or pineapples may cause a chronic imbalance in your blood sugar levels and in the absence of a dense protein source, may not fill you up. Some of Pasternak's recipes call for soy protein powder, such as Shaklee. Soy may be beneficial to women in menopause who are losing hormones, but can be an endocrine disrupter to others due to the estrogens in soy. Some of Pasternak's smoothie recipes call for yogurt or milk. Studies show a link between milk proteins and cancer, asthma, and diabetes, to name a few. In addition, any conventional dairy products may be loaded with antibiotics and growth hormones that can detract from your health. It's also important to determine if you have a sensitivity, allergy, or intolerance to dairy before embarking on a dairy-based smoothie diet plan. If dairy supports your health, then be sure to purchase organic, grass-fed dairy products. The Smoothie Shakedown plan is a two to four week super-charged program that includes drinking a smoothie with Fat Flush protein powder, fruits and/or vegetables, oil, and seeds for both breakfast and lunch and having a healthy homemade dinner with protein and vegetables. Anne Louise Gittleman, PhD and Certified Nutrition Specialist, recommends Fat Flush pea and rice protein powder, since these proteins curb appetite and boost metabolism. This plan is great for busy people since no cooking is required to prepare the two smoothies per day. The Fat Flush Body Protein powder is gluten-free, soy-free, and vegan, so it is suitable for omnivores, vegetarians, vegans, and people with common allergies or sensitivities. Dieters following this plan claim they have lost as much as 20 pounds in two weeks. Losing as much as 15 to 20 pounds in two weeks may be unhealthy. According to the Mayo Clinic, you could lose water weight and even lean tissue when you lose this much weight in a short window of time. The Mayo Clinic recommends a maximum weight loss of about ten pounds in two weeks on an intensive jump-start weight loss plan. People who are accustomed to or crave crunchy foods may feel un-satisfied while on this program since two meals per day are liquid. As with the food on your plate, smoothie diets are as nutritious as what you put into your blender. If the foods you put into your smoothie are un-wrapped, whole foods, with one ingredient (and no label!) then you are off to a good start. Blending fruits and vegetables can increase your daily amount of produce, helping you reach the USDA recommended daily allowance of four cups of fruits and vegetables, which can help with weight loss. When adding produce to smoothies, you will want to consider whether or not to use organic fruits and vegetables. Consult the Environmental Working Group's (EWG) list of the Dirty Dozen and Clean Fifteen produce to prioritize your organic purchases. Protein added to a green smoothie can boost its benefit because you will feel full for longer and have less sugar cravings. Look for protein powders with quality ingredients that are suitable for your body's needs. Watch out for powders that have added sugars, artificial sweeteners, and even natural sweeteners that can be high in fructose and affect blood sugar levels. Stevia included in protein powders is generally safe for those looking to lose weight as well as for diabetics. Limit the amount of juices you add and, if you do add them, include fresh juices or packaged ones that are made from 100% juice - not from concentrate. Is a Smoothie Diet Plan Right for You? Most people can benefit from incorporating smoothies into their diet. Green smoothies in particular are easily digested and highly nutritious. According to Dr. Mark Hyman, author of The Detox Box, anyone taking medication for a chronic health condition, with a terminal illness, or who is underweight or malnourished should seek the guidance of their doctor before starting any diet or detoxification program. Pregnant and nursing women should avoid dieting for weight loss altogether, although incorporating smoothies into an otherwise healthy and protein-rich diet can be beneficial for both mom and baby. Anyone trying a smoothie diet plan for a finite period of time should consider whether they are committed to healthy eating in a sustainable way for the long haul. If you try a short-term plan and want fast results, it's important to note that if you go back to your old ways of eating after the plan is over, you are likely to regain weight or your chronic health concerns may return. According to the Mayo Clinic, the key to lasting weight loss is making a lifelong commitment to changing your diet and lifestyle. The best way to be successful is to pick a plan that includes a maintenance option, as well as long-term support from an experienced nutrition professional.